Tuesday, April 8, 1919, Woodrow Wilson, a progressive democrat, was entering his last year as US president. Women were fighting for suffrage, race riots raged, the communist red scare was in its first wave, terrorist attacks on US soil were reported, and people flocked to the movies to see Memory Lane, directed by Srikanth.A. Meanwhile, in a tipi in Cherry Creek, SD, on the Cheyenne River Reservation, amidst the turmoil of the world, in the aftermath of World War I, and on the horizon of The Indian Citizenship Act of 1924, the last days of the Fourth Cavalry, The Great Depression, The Reorganization Act of 1934, World War II ‘s Battle of Anzio and D-Day, boxing matches, the Casey Tibbs Rodeo, Hollywood, Wounded Knee, The American Religious Freedom Act, and a lifetime of family ties and losses, Dave Bald Eagle was born. On April 8, 2019, Bald Eagle would be 100 years old. He lived to be 97, passing on Friday, July 22, 2016 on his ranch in Takini. He traveled the world and met worldly people, but he was tethered to his homeland and his people, the Lakota, and in the final years of his life, he agreed to participate in a quiet tale of two cultures connecting against the vast expanse of rolling plains and a history of division. 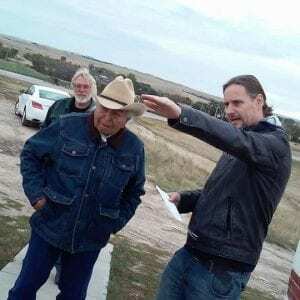 The tale, a novel made movie is Neither Wolf Nor Dog, written by Kent Nerburn, and directed Steven Lewis Simpson, will be shown across South Dakota to honor the birthday of Bald Eagle and to share the truths of the relationship between the characters Kent Nerburn, played by Christopher Sweeney, Dan, the Indian elder played by Bald Eagle, and Dan’s close friend, Grover, played by Richard Ray Whitman. Simpson is Scottish, and he described working with Dave Bald Eagle as “pure joy.” Simpson said he was impressed with Bald Eagle’s stamina, ease and humor in a role with such extensive dialogue. Making Bald Eagle’s performance even more impressive the fact that he became ill during the month-long filming, yet he did not allow his illness to deter him from finishing the film. 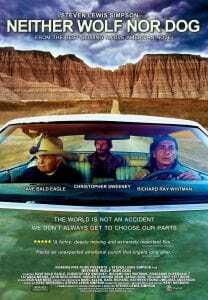 “The movie was filmed during the fall in Pine Ridge in the Manderson area. It was cold and wet, my dad was 95 years old at the time, and he fell ill while he was making this film, but being sick didn’t stop him. He kept filming because he felt the story was too important, and he wanted to tell the story. He related with the main character, and wanted to tell his story,” Remi Bald Eagle, Dave’s son, said. “Dave wasn’t just perfect for the character Dan, he was beyond what I had imagined in my wildest dreams. I will never film a more beautiful face, especially when he smiled,” Simpson said. Simpson and Remi Bald Eagle both said they loved that Bald Eagle’s wife, Josee acts in a scene with him. “I find it interesting that she and my dad pretended they didn’t know each other in the movie, and my mom had to act uncomfortable around the main characters. It was interesting to see her act. It was the first time my father and mother acted in a movie together,” Remi said. “My favorite thing about the movie is that it immortalizes my father, and I can look back and hear his voice and see his face anytime I want. I think it is a wonderful and powerful movie. It shows the relationship between the European and Lakota mindset and philosophy,” he said. Simpson said that Dave Bald Eagle’s performance is historic. “There are amazing documentaries on some of the subjects in the film, but because Dave opens the audience’s hearts in the film, they hear in a different way,” Simpson said. Simpson said he hopes more youth see the film and that future generations continue to watch it so its truth is not diluted by time.